German painter and draughtsman. As well as being an artist, he achieved considerable success as a doctor, a naturalist, a scientist and a psychologist. As an artist, he was concerned almost exclusively with landscape painting, although he never practiced it professionally. While still at school in Leipzig, he had drawing lessons from Julius Diez; he subsequently studied under Julius Schnorr von Carolsfeld at the Oeser drawing academy. From 1813 he taught himself oil painting, copying after the Dresden landscape painter Johann Christian Klengel, whom he visited in his studio. In 1811 after six years at university he graduated as a doctor of medicine and a doctor of philosophy. In 1814 he was appointed professor of obstetrics and director of the maternity clinic at the teaching institution for medicine and surgery in Dresden. He painted on his leisure time, but it was his writing on art theory that made him a leading scholar of his period. 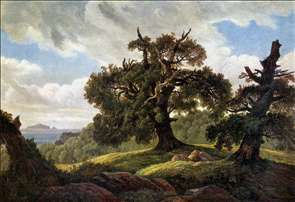 In 1831 his Letters on Landscape Painting appeared, in which he attempted to refute the accusation from Cornelius in 1825 that landscape was at most "moss or undergrowth on the great trunks of art." 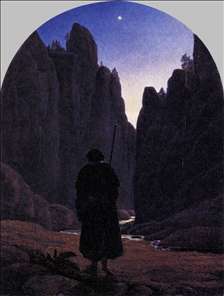 He had taught himself the techniques of painting, and found his own way intellectually. 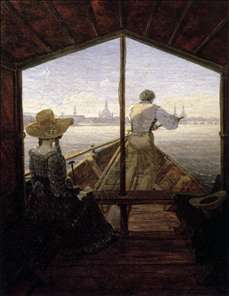 See more details about "A Gondola on the Elbe near Dresden"
See more details about "Oaks at the Sea Shore"
See more details about "Pilgrim in a Rocky Valley"